The elementary qualities are four, and any four terms can be combined in six couples. Contraries, however, refuse to be coupled: for it is impossible for the same thing to be hot and cold, or moist and dry. Hence it is evident that the "couplings" of the elementary qualities will be four: hot with dry and moist with hot, and again cold with dry and cold with moist. And these four couples have attached themselves to the apparently "simple" bodies (Fire, Air, Water, and Earth) in a manner consonant with theory. For Fire is hot and dry, whereas Air is hot and moist (Air being a sort of aqueous vapour); and Water is cold and moist, while Earth is cold and dry. Aristotle (384-322 B.C.) was born in Thrace where his father, Nicomachus, was a physician to the king of Macedonia. At the age of 18, Aristotle went to Athens and entered the Academy of Plato; he remained there until Plato's death in 347 B.C. Subsequently, Aristotle went to the city of Assus where he lived for three years. His friendship with Hermias, ruler of that city, led to his marriage to Pythias, the ruler's niece and adopted daughter. About 343 B.C. Aristotle removed to the city of Mitylene. That same year he was summoned by King Philip to the court of Macedonia to tutor Prince Alexander, then a youth of thirteen years. Aristotle remained at the Macedonian Court until the beginning of Alexander's Asian expedition to conquer the Persian Empire. In the year 335. B.C., Aristotle returned to Athens and there opened his own school in the gardens dedicated to Apollo Lyceios. Because of its location, this school came to be called the Lyceum. The school was also frequently referred to as the "Peripatetic School" probably due to Aristotle's custom of discussing and conversing with his pupils while walking along the shady lanes of the garden. Aristotle taught in the Lyceum for twelve or thirteen years, and composed the greater part of his books during that time. Upon the death of Alexander in 323 B.C., a nationalist party led by the great Greek orator Demosthenes came to power in Athens. Aristotle, was considered to be a Macedonian sympathizer and was accused of impiety; he was subsequently found guilty and was sentenced to death. Just prior to his conviction, and anticipating a death sentence, Aristotle voluntarily retired to the city of Chalcis, where he possessed a villa inherited from his mother. Just before departing for exile, remembering the Athenian condemnation of Socrates that occurred many years before, Aristotle is said to have exclaimed: "I do not wish that Athens should sin twice against philosophy." Aristotle died at Chalcis at 62 years of age. Aristotle was an extraordinarily prolific writer. Some of his works were intended for the general public and the others for students in the Lyceum. The works intended for the general public have all perished. However, many of the works (mostly lecture notes) destined for his school have survived. The scholar B. Lukács of the Hungarian Academy of Sciences has estimated that about three-fourths of Aristotle's writings have been lost. His rather detailed analysis supporting this conclusion is available on the Internet under the title "A Note to the Lost Books of Aristotle." A complete listing of all of Aristotle's works, then extant, was compiled by Andronicus of Rhodes in about 60 B.C. Andronicus grouped the works by category and arranged them in an order of study: first logic, then natural science, then metaphysics, then ethics and politics. Please note that Metaphysics, as the title suggests, follows next in order after the works on natural science (physics), and just before the works on ethics and politics. As the above table indicates, there is hardly any area of knowledge that Aristotle did not write about. Unlike Plato, Aristotle considered human sensory perceptions to be the essential raw material of knowledge. He regarded direct observation to be the foundation for understanding the natural world. He was one of the first people to actually make physical observations of plant and animal life, including dissection of such creatures, to attempt to understand their characteristics and functions. In this regard, Aristotle was the founding father of our modern-day biological sciences. Most of his theories concerning the natural world have since been completely overturned. Even so, he is probably the principal precursor of modern scientific methodology. 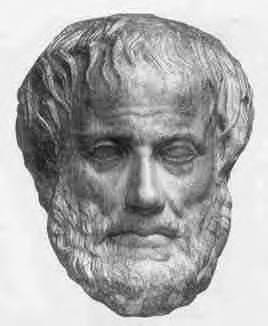 Two alchemical theories are attributed to Aristotle, i.e., the ideas of Matter and Form. To understand these ancient Aristotelian and alchemical ideas, one must put aside certain modern chemical concepts such as atoms, chemical elements and pure substances. For example, according to modern science, Sulfur and Iron are different kinds of matter. But for Aristotle, they are the same matter only specified by different forms (forms may be considered to be like geometric shapes). To Aristotle, change is an essential characteristic of all physical objects as well as people. Change affects all things including changes in oneself. This point can not be emphasized enough. For Aristotle there was change and there was the changeless. Using an alchemical example here: Iron changes into rust - something changes and something persists. That which persists is called Matter and that which changes is called Form. In the case of a bronze statue of Apollo, bronze is the Matter and Apollo is the Form. However, for bronze itself, earth and water are the Matter, and the cause of the properties of bronze the Form. For Aristotle matter was not something that you could see or touch. Aristotle taught that all terrestrial bodies were composed of four elements or radical principles, namely: fire, air, earth, and water. These elements determine not only the natural warmth or moisture of bodies, but also their natural motion, upward or downward, according to the preponderance of air or earth. Conversely, celestial bodies were not constituted by the four elements but by ether, the fifth or "quintessential" element, the natural motion of which is circular. This fifth element, Ether, was the prima materia, the element that enveloped all other things in this world. It was the key to finding the Philosophers Stone (Lapis Philosophorum). The Philosophers Stone had an enormous potency; a small quantity could transmute a very much larger quantity of base metals into silver or gold; it also had unprecedented powers of healing the human body and indeed of perfecting living things in their kind. In Aristotle's view, the Earth is the centre of the cosmic system; it is a spherical, stationary body, and around it revolve seven spheres in which are fixed each of the seven planets. The First Heaven is the heaven of the fixed stars. It surrounds all the other spheres and, being endowed with intelligence, it imparted to all the other heavenly bodies the circular motion which is natural to them. These doctrines, as well as the general concept of nature as dominated by design or purpose, came to be taken for granted in every philosophy of nature down to the time of Galileo, Kepler, and Newton and the birth of modern chemical and physical sciences. Some of Aristotle's views on human thinking and consciousness will form the remainder of this essay. Where possible I will provide direct quotations from his extant works to support the idea or ideas discussed. Aristotle believed that the seat of human thought and emotion was the heart. Conversely, he believed that the main purpose of the brain was to cool the blood and thereby prevent the heart and lungs from becoming overheated. He also believed that the brain was the cause of sleep. Now, it has been definitely settled already in another work that sense-perception in animals originates in the same part of the organism in which movement originates. This locus of origination is one of three determinate loci, viz. that which lies midway between the head and the abdomen. This in sanguineous animals is the region of the heart; for all sanguineous animals have a heart; and from this it is that both motion and the controlling sense-perception originate.